Oxidative phosphorylation is a metabolic process in which energy is harnessed for the production of ATP. The process occurs in the mitochondria. Electrons released through the oxidation of glucose are shuttled into the oxidative phosphorylation supercomplex via FMNH2. The electrons are passed through a remarkable electron transport chain along and across the mitochondrial membrane. The electron transport chain releases minute amounts of energy with each electron transfer, and the transport is coupled to the pumping of protons across the mitochondrial membrane. Eventually, the electrons are delivered to molecular oxygen, which is reduced to water. Finally, the protons that have gathered on the edge of the mitochondrial membrane cascade back across, turning a molecular millwheel that drives the manufacture of ATP. The ATP is used to power processes throughout the cell. The mitochondria are the site of metabolic activity in the eukaryotic cell. The citric acid cycle occurs within the mitochondrial matrix, catalysed by a range of metabolic enzymes. For this reason, mitochondria are sometimes called "the power plants of the cell". Oxidative phosphorylation plays a central role in this production, harvesting electrons from NADH and succinate to manufacture ATP. The complexes involved in oxidative phosphorylation are embedded in the inner mitochondrial membrane. 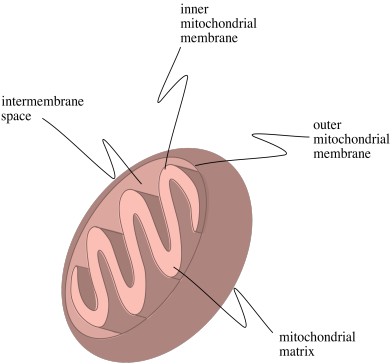 In the picture below, the lower portion of the outer mitochondrial membrane is visible at the top. The inner mitochondiral membrane stretches across the middle of the picture. Both membranes are formed by lipid bilayers. In contrast, both the intermembrane space and the mitochondrial matrix are aqueous environments. The complexes that take part in oxidative phosphorylation are labelled I-V in the picture. Each complex is actually a collection of different proteins; Complex I alone is composed of over 40 protein subunits, but in the picture above each complex has been simplified to one monolithic block. Each complex has its own specialised role. Both Complex I and Complex II serve as entry points for electrons into the respiratory electron transport chain. Complex I accepts electrons from NADH, produced in glycolysis and the citric acid cycle. Complex II accepts electrons from succinate, which is one of the intermediates in the citric acid cycle. In fact, Complex II is an integral part of the citric acid cycle, since it carries out a key step in that process. Complex I and II are the entry points for electrons into the electron transport chain. Both Complex I and Complex II release small amounts of energy as electrons roll energetically downhill to sites of higher and higher reduction potential. The electrons are then shuttled to the same acceptor, Complex III, via a lipid-soluble electron carrier molecule. The electron transport chain continues, releasing some more energy before the electrons are passed to the final destination in Complex IV. 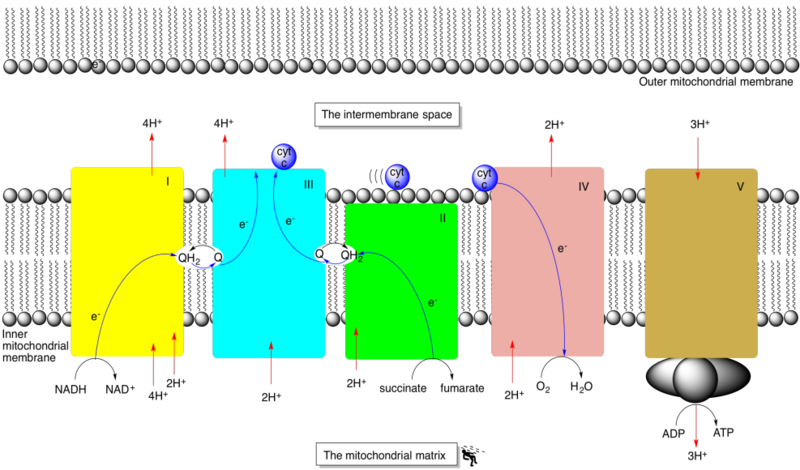 This time, the trip from Complex III to Complex IV is conducted via a hydrophilic protein, cyctochrome c. Electrons travel through Complex IV, back towards the matrix, and are accepted by molecular oxygen, resulting in its reduction to water. Small amounts of energy are released as electrons move to sites of higher reduction potential. Complex IV is the final destination of the electron transport chain. In Complex IV, electrons are used to convert O2 to H2O. Complex I, III and IV all use the energy released from the electron transport chain to pump protons from the matrix into the intermembrane space. The proton gradient that results across the inner mitochondrial membrane is used to power ATP production in complex V. In addition, a couple of protons are consumed by Complex I and Complex II as they package electrons into the lipid-soluble carrier, ubiquinone/ubiquinol. However, Complex II does not transport any electrons all the way across the inner mitochondrial membrane. Complex I, III and IV all use the energy released from the electron transport chain to pump protons across the inner mitochondrial membrane. The proton gradient across the membrane drive a nano-millwheel used to manufacture ATP from ADP and inorganic phosphate. In the following pages we will take a closer look at each of the complexes that take part in this process. Visit an overview of oxidative phosphorylation at Henry Jakubowski's Biochemistry Online.